Happy Monday my friends. Did anyone get snow this morning? We got a dusting here in Boston, but now it's raining so everything is just wet and slushy. There is nothing more beautiful than a white Christmas, so I'm hoping that we'll get more snow for the holidays. 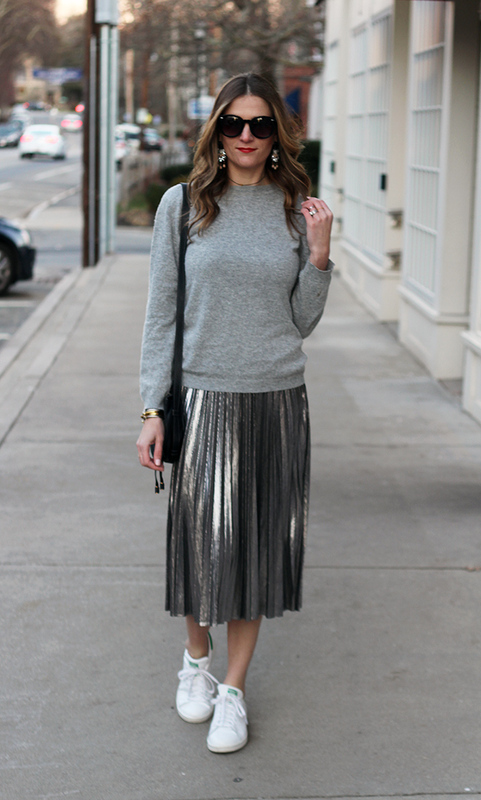 Speaking of the holidays, one trend that I'm loving this season is metallic, especially when it comes in the form of a pleated skirt. Not only does the shimmery material add a little edge to such a classic piece, but it's perfect to dress up for a holiday party or New Years Eve look. I have to admit that I was a little hesitant to add a metallic skirt to my wardrobe because I didn't know how much I would actually wear one, and didn't want spend the money on something that I would only wear once. However, after a little browsing on Pinterest and seeing metallic skirts styled casually, I had to give the look a try, and I'm loving it. I found this metallic pleated skirt at Forever 21 for under $25, which also made it a no-brainer to try the trend. I wanted to go for a monochromatic look, so I paired it with a grey knit, and finished my look with a pair of sneakers for a cute, cozy and put together outfit. I love that I can literally wear this everywhere from the grocery store to drinks with the girls. 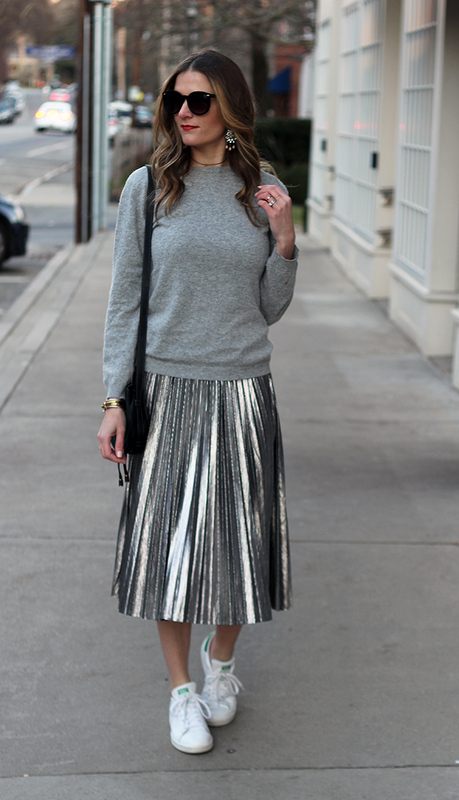 Tell me, would you wear a metallic skirt casually? Make sure to stop back later this week as I'm showing you how to style a metallic pleated skirt dressed up for a holiday party. Loving this cute sporty chic look! I am swooning over this skirt! You could dress it up or down! What a gorgeous metallic skirt! Love the entire look. Happy holidays! I totally !over this! Can you perhaps add me to your linkup list? I would appreciate it very much. Thank you Nancy! I've been meaning to update my linkup list for a while, and just finally did. Can't wait to link up with you this week! Love this look! The perfect combo of glam from the skirt and edgy from the sneakers. The colours are Very cool. The metallic skirt and the top fits perfectly. But that bag is so so beautiful and simple. You rock absolutley girl. Nice sneakers too. I love dressing down a really fun + statement piece like this skirt! So cool, babe. love the beanie with the skirt! super cute outfit! I am loving that metallic skirt! It's perfect dressed up and down! I've been loving all the pretty metallic skirts lately! This one is so fabulous dressed down! 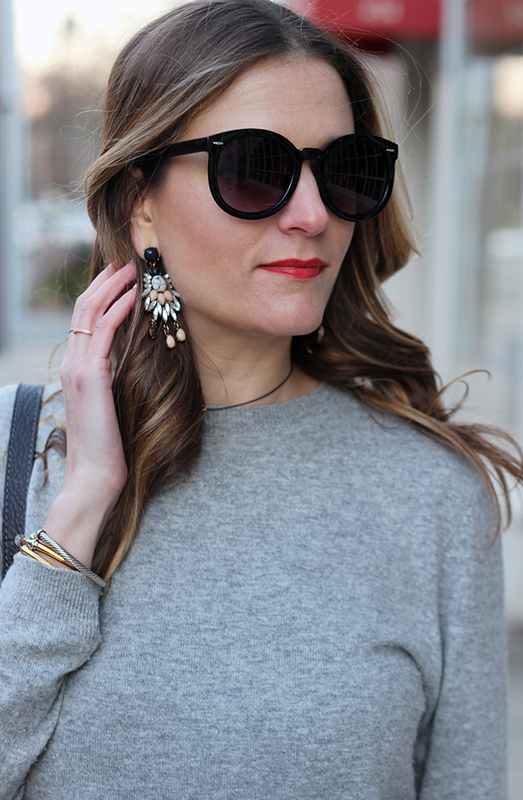 Comfy and glam! Love it! Obsessed with how you styled a skirt with sneakers! So street style and cool! I was totally thinking about buying that skirt! Now I can see it would be way too long on me, haha. I love that you've styled it casually, it's more fun when you have these items and don't just save them for special occasions. 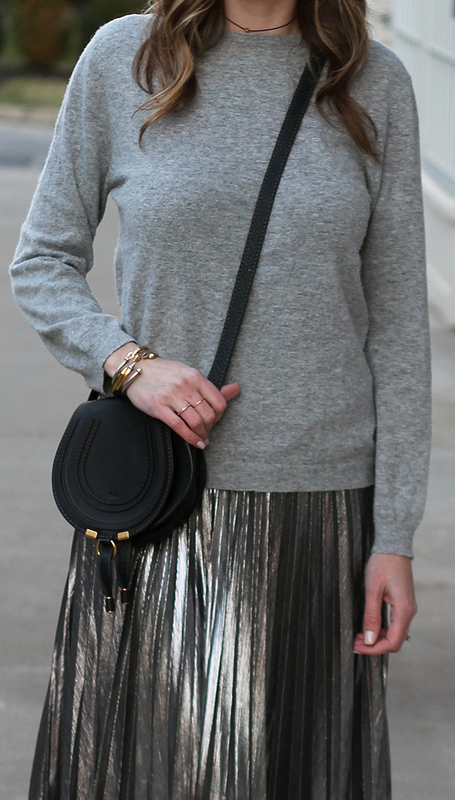 Love how you styled this metallic skirt and the back detail on your sweater is fabulous! In LOVE, what a great way to mix street style with chic and make it work out. I love how this skirt makes me think of New Years too, hard to believe 2017 is around the corner.